The following easy caves have relatively high ceilings and smooth floors. These caves are good for groups of all ages who want a less strenuous activity. Even though these caves are classified as easy, don’t be surprised if you are winded or dripping with sweat when you finish. One of our favorite caves is the Valentine Cave. It is a very high and wide cave. 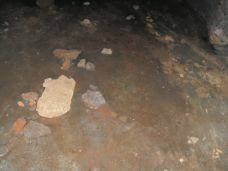 The floor is mostly smooth with rough patches. It is advised to keep one flashlight on your path and one on the cave ahead of you. This is a good cave to experience total darkness once you get further into the cave. 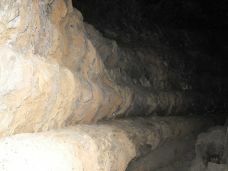 The opening to the cave is divided by a large pillar with benches (see picture). The cave is over 1600 feet in length. One of the first caves you visit has to be the Mushpot Cave. It is close to the Lava Beds Visitor Center. The cave has lights and interpretive signs explaining the different formations. Guided tours are given during the summer months and there is a small theater with seating in the cave. The ceiling is 8 feet or higher in most spots but there is one section where the ceiling drops to a level of 4 feet. This cave is over 750 feet in length. Merrill Cave is located off the main road north of the Visitor’s Center. It consists of two levels connected by a ladder. My son, Josh, can be seen climbing down the ladder. This cave used to be an ice cave but recently a breeze was discovered coming from below the ice and the ice has melted. 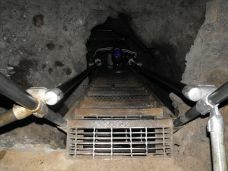 A barrier has been placed at the bottom of the cave to prevent further deterioration. Another pair of easy caves are the Ovis Cave and the Paradise Alleys. These two caves are joined and you can enter one cave and leave from the other. 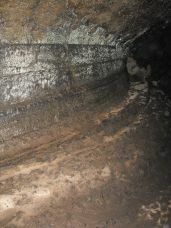 Ovis Cave is over 200 feet in length, 52 feet wide, and about 30 feet high. Paradise Alleys consists of two passageways connected by a pit with a stairway. Paradise Alleys is over 1000 feet in length. Sentinel Cave is off the Cave Loop that leads from the Visitor’s Center. This easy cave has two entrances and can be accessed from its own trail. The meandering trail inside the cave is about 1,100 feet. It is a very easy trail and has a lot of interesting features. No stooping or ducking is required in this cave. 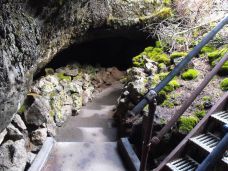 The Skull Cave is located off the main road north of the Lava Beds Visitor’s Center. This ice cave has several layers and the path is very easy to navigate. The opening to the cave is one of the largest in the park. Proceed along the path to your right until you get to the stairways. The railing can be very cold so it is recommended to have a pair of gloves. At the bottom of the cave you will be able to see the ice that’s there year round. Historic American Indian pictographs are located at the opening of Big Painted Cave and Symbol Bridge. Access to this site is down a trail close to the Skull Cave. This is an easy hike and is only 3/4 of a mile in length. Return to Lava Beds Page from Easy Caves Page. Return to Home Page from Easy Caves Page.